Monroe City Manager Bill Brock is recommending to Council the creation of the position of Public Safety Director to oversee the operations of the Police and Fire Departments and the Appointment of John Centers and Frank Robinson as Fire and Police Chiefs. Once created, Brock will approve the job description. The intent would be to begin the new organizational structure effective June 1 if approved. If not approved, Brock would still need an appointment to Fire Chief effective June 1. Brock is recommending Asst. 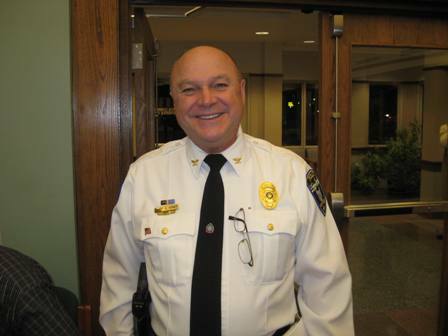 Chief John Centers be appointed as Fire Chief effective June 1. This appointment will carry a one-year probationary period. The appointment of a Fire Chief is necessary due to the retirement of Mark Neu. Brock is recommending Lt. Frank Robinson be appointed to the position of Police Chief effective June 1. The appointment will carry a one-year probationary period. According to Brock, the appointment of a Police Chief is necessary due to the promotion of Greg Homer to Public Safety Director. administrative support to the City Manager. and administer policies and procedures. effectiveness of service delivery methods and procedures; allocate resources accordingly. opportunities for improvement; direct and implement changes. with key staff to identify and resolve problems. employees to correct deficiencies; implement discipline and termination procedures. budgetary adjustments as appropriate and necessary. correspondence; attend City Council and other meetings as required. assigned activities with those of other departments and outside agencies and organizations. department programs, policies, and activities; negotiate and resolve sensitive and controversial issues. and related support services; incorporate new developments as appropriate. 13. Perform related duties as required and as assigned by the City Manager. time in order to successfully perform the assigned duties. associated programs, services, and operations. • Advanced principles and practices of program development and administration. custody of persons and property, and crime prevention. operations including fire suppression, fire prevention, fire investigation, and emergency medical response. • Principles and practices of disaster preparedness, response, and recovery. • Operational characteristics of police and fire apparatus and equipment. • Recent court decisions and how they affect department operations. • Methods and techniques of public relations. • Pertinent federal, state, and local laws, codes, and regulations. • Principles and practices of municipal organization, administration and personnel management. • Principles and practices of municipal budget preparation and administration. • Principles of supervision, training and performance evaluation. • Develop and administer departmental goals, objectives, and procedures. • Identify and respond to sensitive community and organizational issues, concerns, and needs. • Plan, organize, direct, and coordinate the work of lower level staff. recommendations in support of goals. • Prepare clear and concise administrative and financial reports. • Prepare and administer budgets. • Retain presence of mind and act quickly and calmly in emergency situations. • Effectively use specialized public safety tools and equipment including safety equipment. • Meet the physical requirements necessary to safely and effectively perform the assigned duties. • Operate modern office equipment and computers including applicable software applications. • Gain cooperation through discussion and persuasion. • Mediate and resolve conflict situations. • Demonstrate tact and diplomacy with the public. accepted experience and educational training within the law enforcement and/or fire services. of management and supervisory responsibility. Possession of an appropriate, valid driver’s license. call out at any time. specialized vehicles and equipment; and to verbally communicate to exchange information.